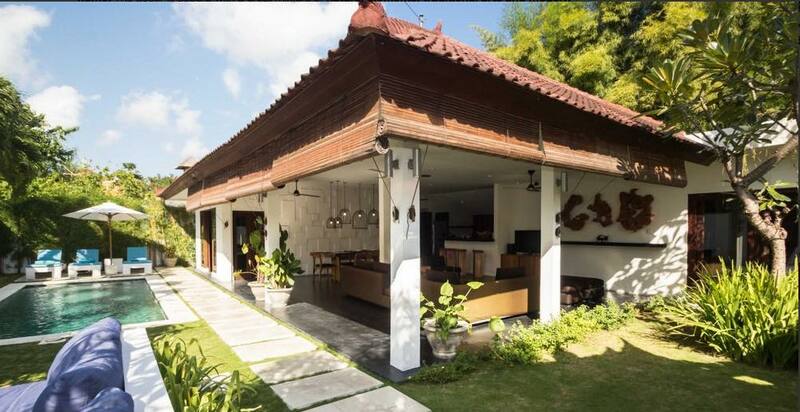 Lovely villa close to 'Eat Street' - rent this now! 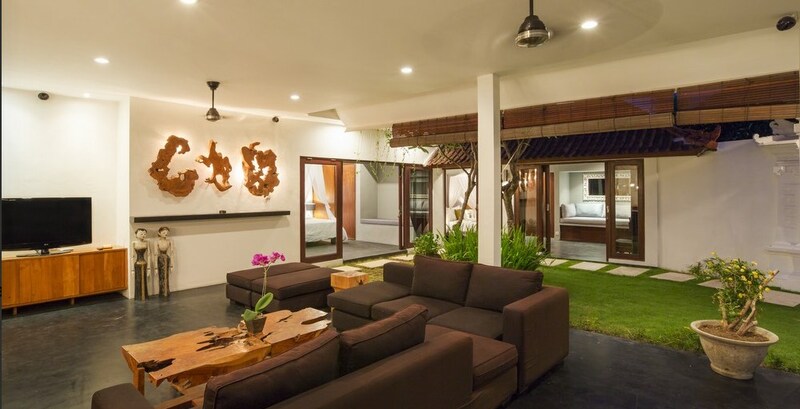 For a 3 bedroom Seminyak villa holiday rental, Villa Damai Lestari ticks all the boxes. 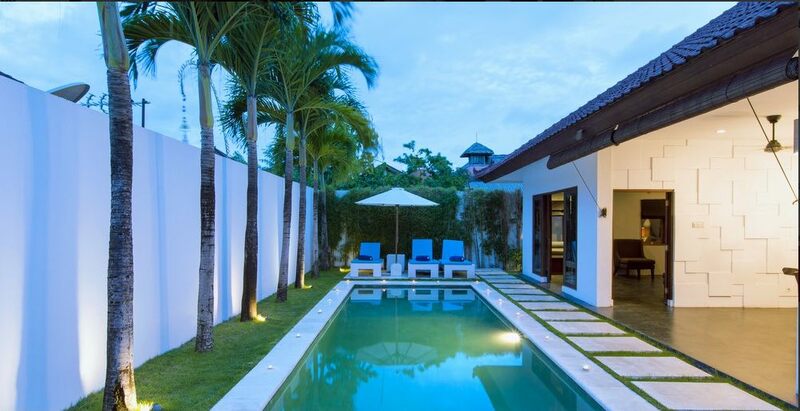 Firstly a prime location, right at the top of Seminyak’s most famous street, close to ATM’s and convenience stores, includes a wholesome breakfast, has a large garden with private pool, spacious living areas, perfect bedrooms with en-suites and best of all its fantastic value for money! 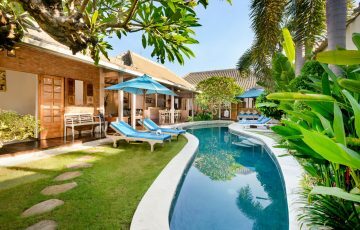 The villa is perfect for a family holiday or group of friends seeking comfortable and affordable accommodation. 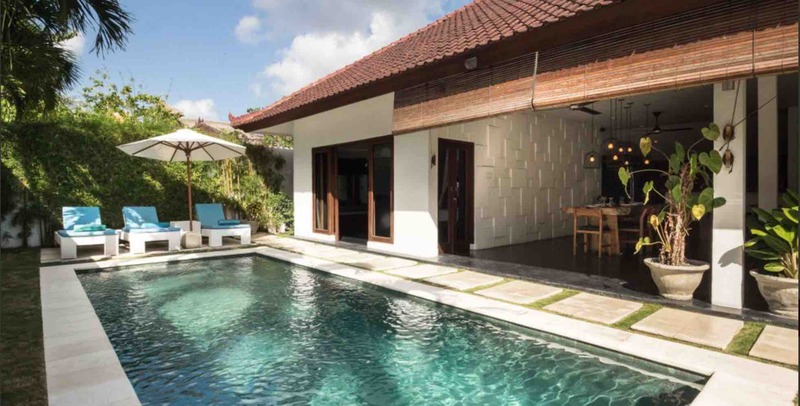 Enter through the antique wooden doors of Villa Damai Lestari and traverse the large stepping stones across manicured lawns to be greeted by the delightful swimming pool. 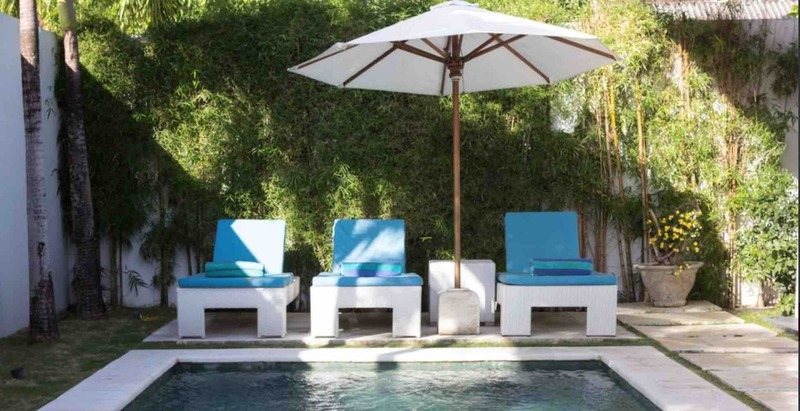 Lined with tall palms there are recliners at one end of the pool and at the other a built in sofa with vibrant blue cushions where you can enjoy a drink maybe a game of cards in between jumping back into the pool to cool off. 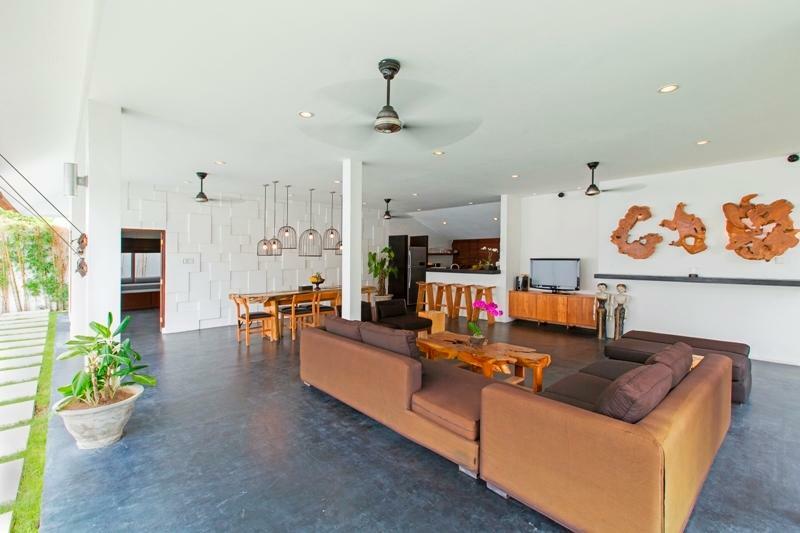 The open air and open plan living area is right by the pool cooled by ceiling fans and its polished floors the area is spacious with a huge sofa positioned in front of the flat screen TV with plenty of international channels to choose from. 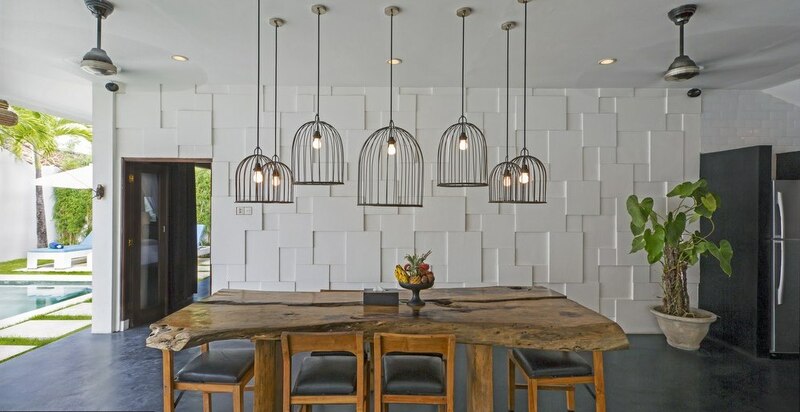 The kitchen is well equipped in case you feel like cooking up a storm or request an in-house chef to dazzle you with culinary delights. The natural timber dining table is at the ready for 6 guests to share meals together. 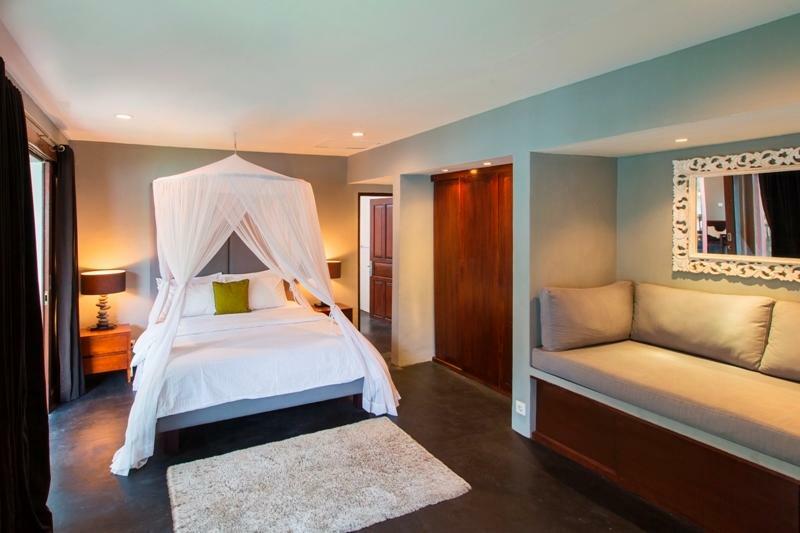 Three en-suite bedrooms are tastefully appointed with king size beds, built-in robes and sofas with soft cushions. 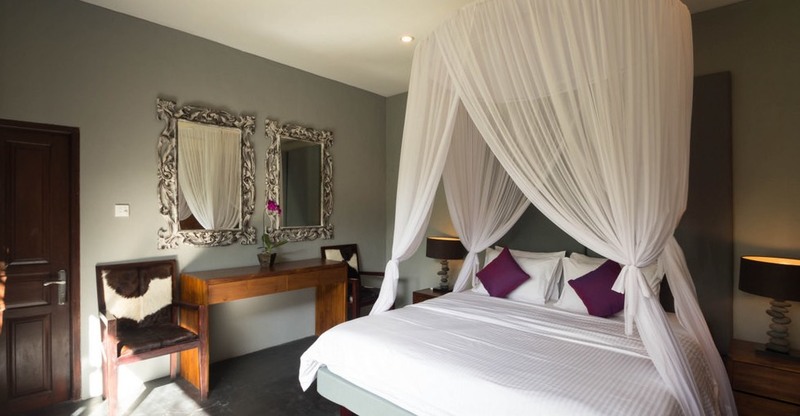 White netting over the beds ensures a comfortable night’s sleep and all rooms are air-conditioned. 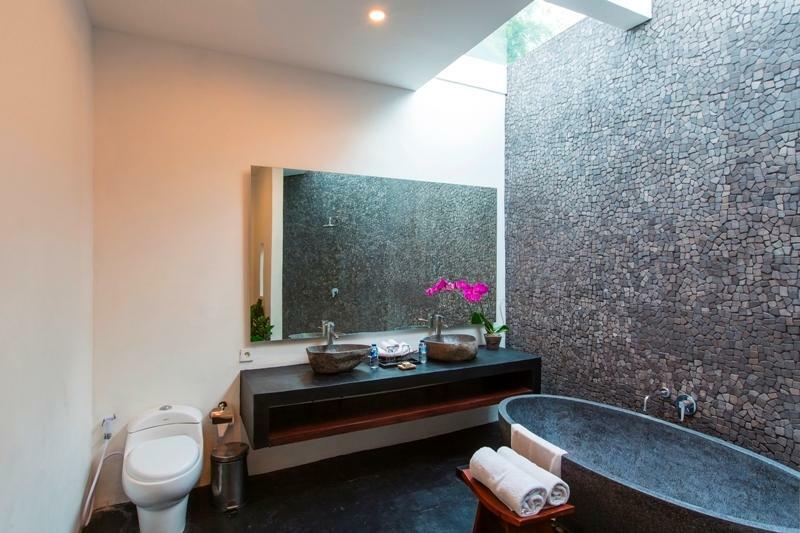 The en-suites are a romantic affair with stand-alone soaking tubs with stone clad walls adding a real sense of tropical ambience. 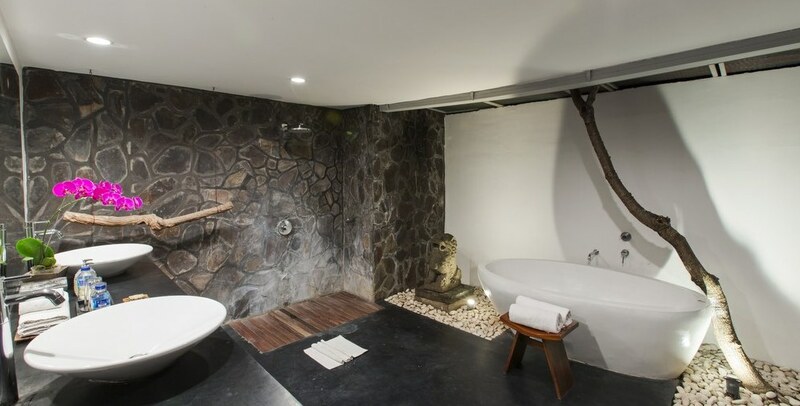 Twin vanities and monsoon showers round out the perfect bathing experience. 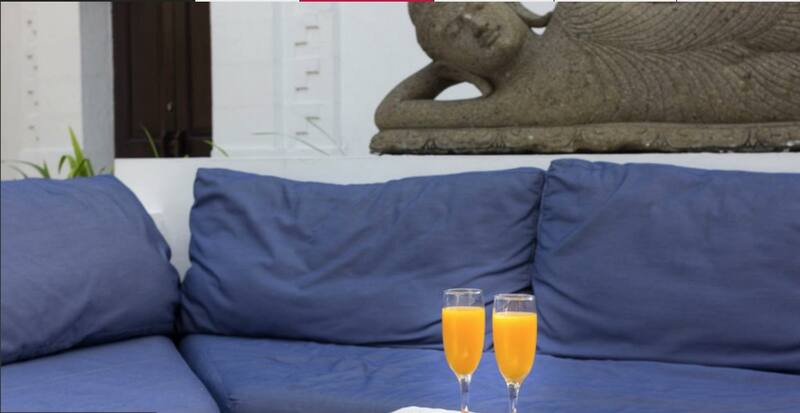 The Balinese staff are warm and welcoming, professionally trained they offer exceptional service and cater to guest’s individual needs. 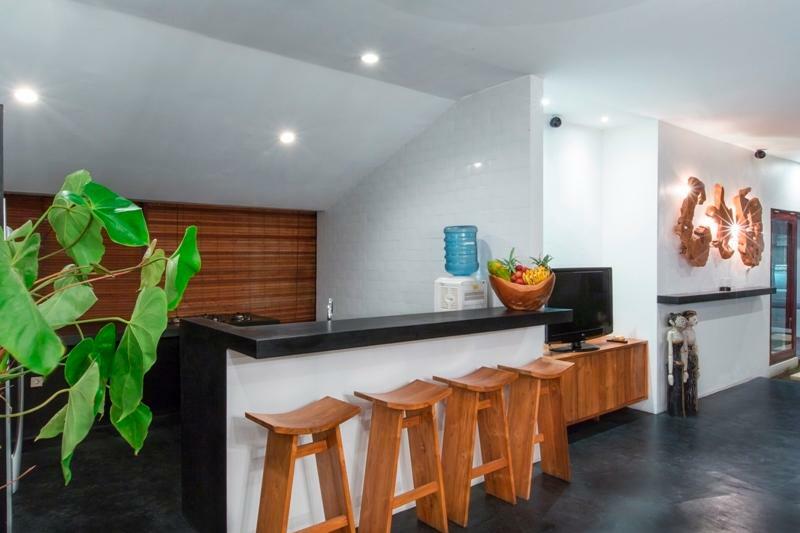 They will be happy to arrange any additional services such as spa treatments, baby sitters, safety pool fences, transportation and day trips around the island. 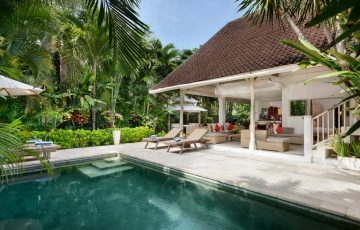 This villa is located in a quiet lane at the top of Jalan Oberoi where you can take a leisurely stroll, stopping at what takes your fancy, maybe the Corner Café for a morning coffee, a couple of the chic boutiques, Rumors for a lunchtime pizza or Mykonos for some beautiful authentic Greek food. 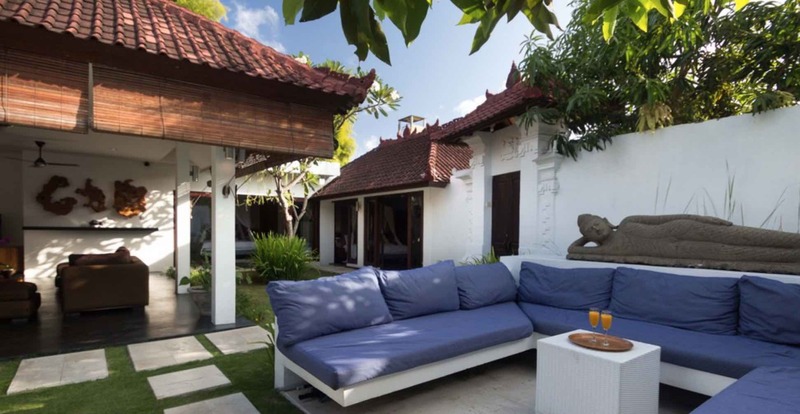 Seminyak Square is nearby with a supermarket, sports bar and a market. 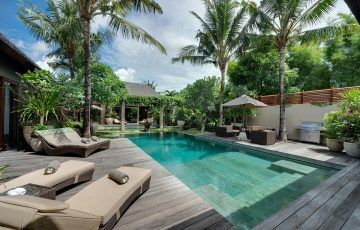 A little further down Jalan Oberoi and you reach the iconic Ku de ta Beach Club or Potato Head and the rolling waves of Seminyak Beach. 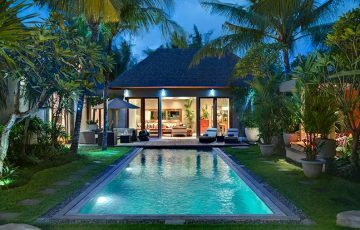 To view other family friendly Seminyak villas or more of our Bali Villas near Eat Street please browse this website or contact our reservation team. This is a really popular Seminyak villa so if your planning a holiday to Bali during the Australian school or public holidays please book Villa Damai Lestari well in advance. Loved this villa and enjoyed the fantastic position. We came here with our family ( 2 adults and 3 children) and had an absolutely fabulous time. 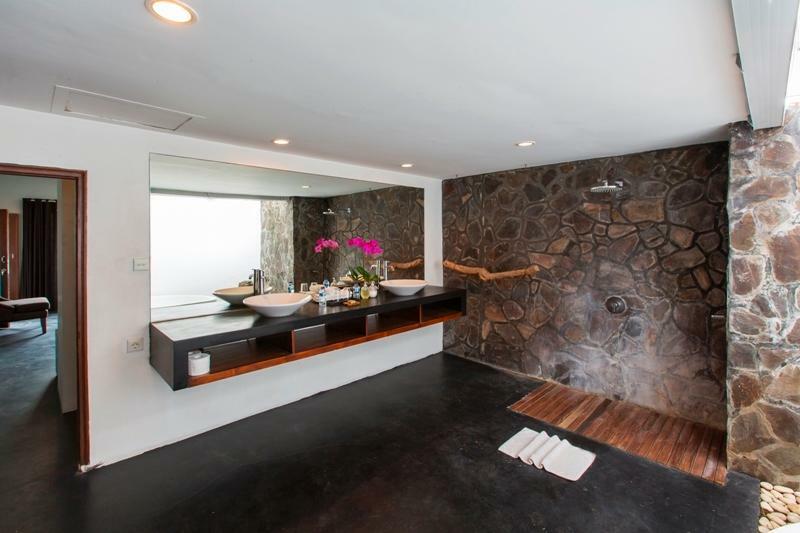 Rooms were meticulously cleaned and very spacious. Staff were also sensational and made sure our stay was comfortable. 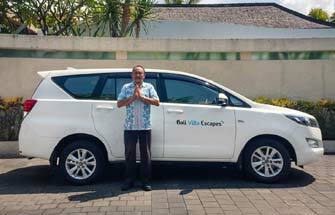 This was our first trip to Bali and the first time we tried staying in a villa. What a great choice and we will do it again next year. 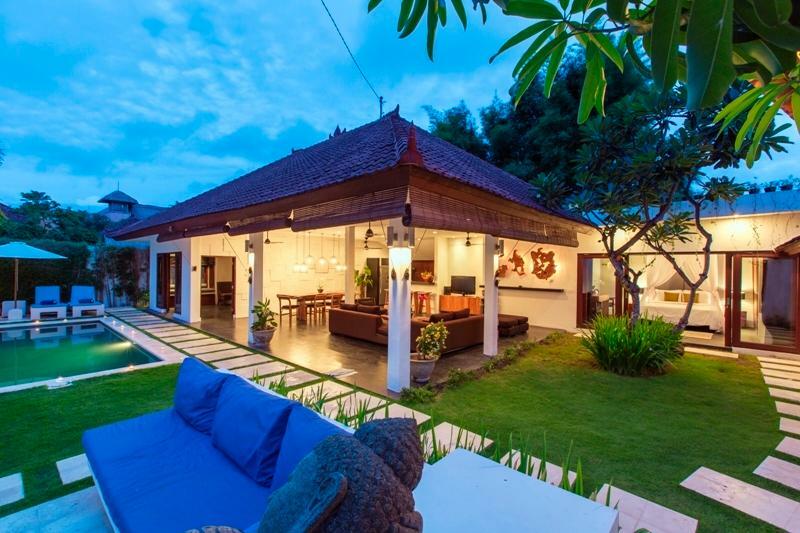 Fantastic villa, so close to all those well known restaurants and really good cafes. Pool and garden area were also lovely and very spacious. An amazing location which was really handy so close to 'Eat St'. This was ideal at night because we could take the kids to try out different restaurants. In regards to the villa, it was sublime and really peaceful. As soon as we entered the villa gates we were immediately struck by how quiet and laid back it was. Pool was also great for the kids to play around in. 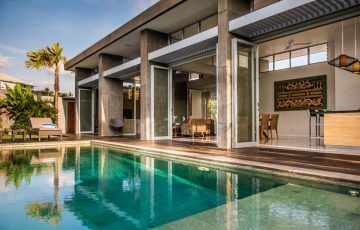 Thoroughly recommended and if your wanting a villa that represents really good value I would certainly give this a try. You will love it!!! 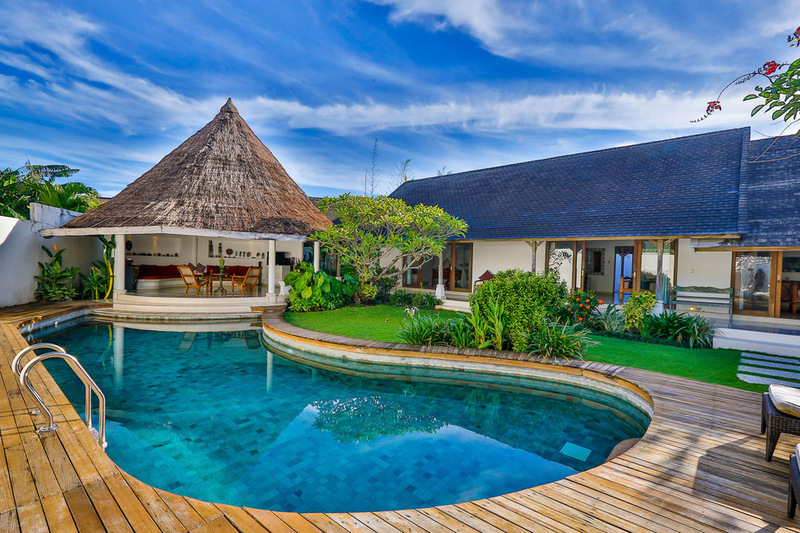 Loved the villa from the moment we arrived., it was like living in our private tropical oasis. A really great location as well, very chilled out and relaxing! Have already recommended it to our friends who will be coming to Bali next year. Clean with lots of room. The swimming pool area was perfect for our group and had just the right amount of sun the whole day. A real winner. 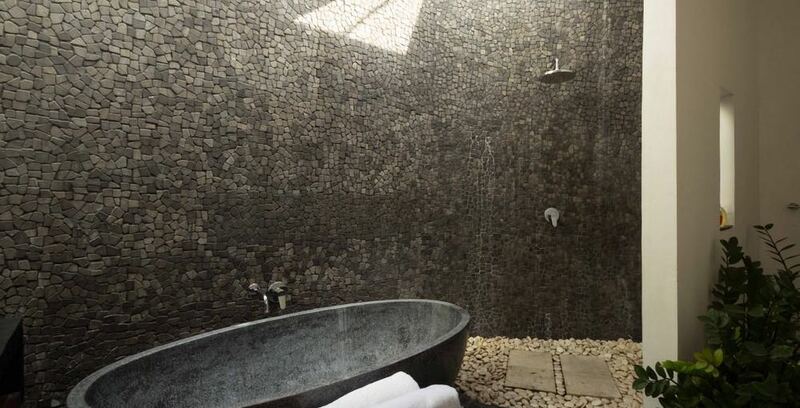 Fun times in a wonderful villa. Kids are begging me to take them back next year. Thanks to all the staff at Damai Lestari for a fantastic time!